Home > My Life Musings	> Unexpected but Welcome! This is a little round-up of award nominations I have recently received. I’m also using it as a shameless plug for a bunch of my posts, so let’s dive straight in! 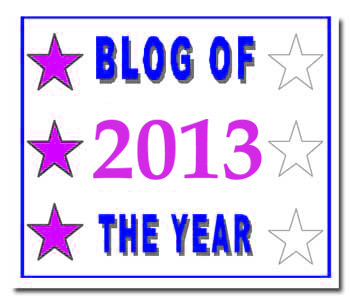 First off, fun with the Blog of the Year Award 2013 (my original post on this along with all the rules, my nominations and all the rest is here). The lovely and talented gentlestitches awarded me a star! I’m pretty sure I got another one along the way as well (!) so that makes a total of 3 stars (if anyone apart from Mer and gentlestitches can remember giving me a star, let me know and I’ll grovel a lot and update this post)! 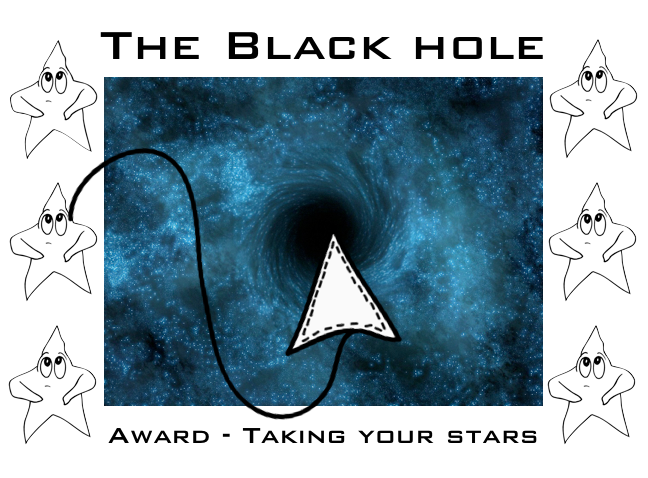 Then, can you believe this, doggy’s style awarded me the Black Hole award, and one of my stars fell in (boo)! Nooo, leave my stars alone. Now, I don’t wanna give up one of my stars 😦 . So my star is in the process of approaching the event horizon, and therefore is still present on my badge. Yay! Now here’s the “Unexpected but Welcome” award. angelswhisper2011 (be sure to visit and read all about the adventures of the cutest kitty-cat ever!) 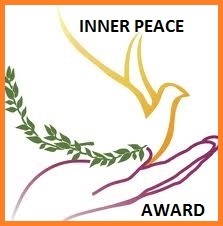 awarded me the WordPress Family award (which I have) and… here it comes… the Inner Peace award! Now, I’ve gone over my last ten fiction posts, just to see how this “inner peace” thing pans out (here come the post plugs). Inner peace – feel the love! I can’t find any rules for this award (yay!). However, I would like to nominate everyone who writes posts under the “Bloggers 4 Peace” banner – you deserve it. You can view lovely posts via that link, and also many people post on their own blogs – just look for the Bloggers 4 Peace banner. Now I have to go scan in some more documents for my solicitor so that my house purchase goes through without any problems – you see now why I need some inner peace? Congratulations on your well-deserved awards! It’s sweet to have crossing roads to stop and give a thought! Have a pleasant and a creative week !!! draliman and inner peace in the same sentence, what an idea. At least in your new home your washing machine won’t be able to electrocute you. Yeah! Hopefully I’ll be able to plug the washing machine in safely. I didn’t actually check where all the sockets are, but the current inhabitant must have plugged it in somewhere! I’m feeling more peaceful already!